« DYNAMITE spring tonic – BUT FIRST, DO THIS RIGHT NOW YOUR LIFE MAY DEPEND ON IT. This is just a lovely little bush in my neighborhood I am trying to ID. 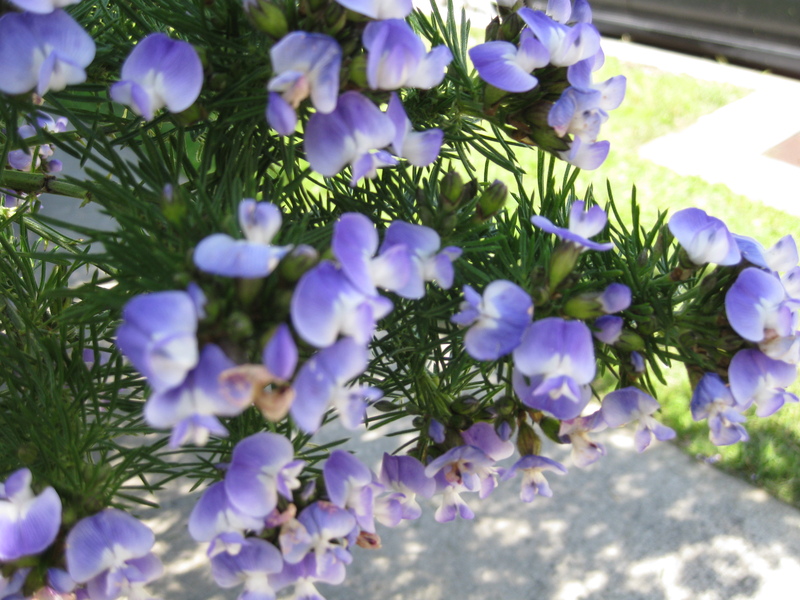 So, it’s a Psoralea pinnata, called the Grape Kool-aid plant because that is what it smells like. Cool. Sorry this is about 2 weeks behind schedule folks. The Japanese tsunami and nuclear meltdown really got me thinking about a disaster kit. We are 19.5 miles from Diablo Canyon Nuclear power plant, on the wrong side of the San Andres fault, full moon, planets lining up, fish kills in Redondo Beach all added up to get the dang kit done. It was an intense two weeks but the kit is done. Thanks for your patience. Just one more thing. There is going to be a universal water prayer for Japan conducted by Masaru Emoto on March 31 at 12 noon. I hope all reading this will be able to join in. Thank you. This European relative of spinach and beets, which grows throughout the North America, bears large quantities of edible, spinach-flavored leaves you can collect from mid-spring to late fall. It’s one of the best sources of beta-carotene, calcium, potassium, and iron in the world; also a great source of trace minerals, B-complex vitamins, vitamin C, and fiber. Wildman has an excellent piece on lambs quarter, also called goosefoot and pig weed. There is a look-a-like that will make you sick. The tell-tale difference is the look-a-like smells like resin. So no worries just pinch the leaves if it stinks let it be. I have found all the plants we are talking about here in my own yard or neighborhood. They are common. I have found, ID’ed and eaten everything I am posting here. I am not going to tell you anything I haven’t tried myself. So, Here is Lambs Quarters which I just found and ID’ed this last winter. One of the tastiest greens out there–It is in your yard – Find It – ID It. Young lambs quarters Ewe to you. Native Americans ate the leaves to treat stomachaches and prevent scurvy. Cold tea used for diarrhea. Leaf poultice used for burns and swellings. Fold remedy for vitiligo, a skin disorder. 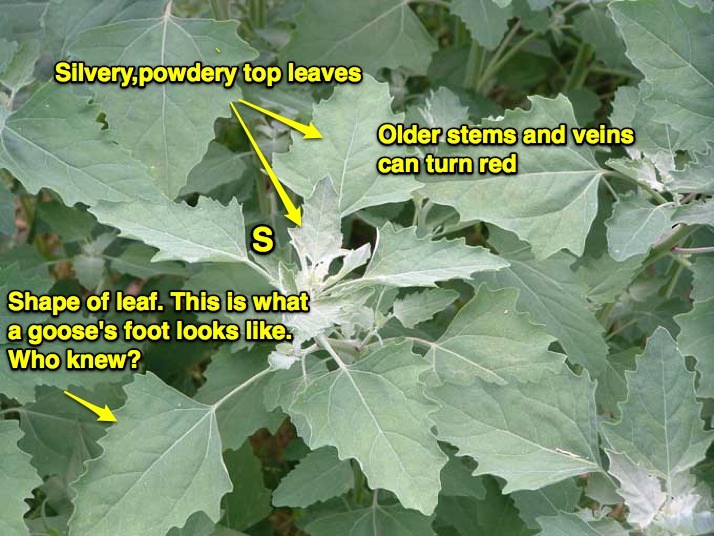 This YouTube has some more interesting facts about Lambs Quarters. Ever heard of quinoa? You will be surprised what he has to say about lambs quarters and quinoa. Most are succulent and have white flowers, and all with practically the same edible and medicinal values. They all exhibit a very interesting trait, (they sleep) termed the ‘Sleep of Plants,’ every night the leaves fold over the tender buds and the new shoots. I suggest you only gather this little darling when the white flowers are present. The look-a-like is the scarlet pimpernel. They grow very close to each other. You can’t tell them apart except for the flowers. is known as the weather vane plant. When a low pressure is approaching the flower will close up to protect its pollen. Low pressure means there is a change of weather on the way. Dandelions flowers will do the same thing. But if there is a puff-ball on the dandelion the plant releases the puff from the stem before it rains to insures reseeding. Watch those puff balls. High pressure means clear skies. I digress. 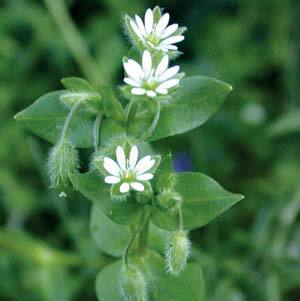 Back to Chickweed. Gather fresh edible plant between May and July, as soon as flowers appear, it can be used fresh or be dried for later herb use. Chickweeds are Medicinal and edible, they are very nutritious, high in vitamins and minerals, can be added to salads or cooked as a pot herb, tasting somewhat like spinach. 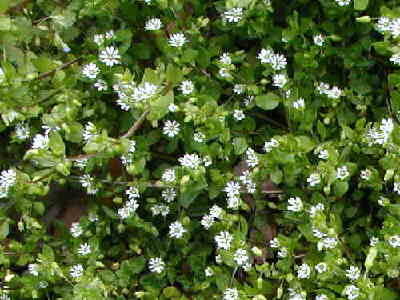 The major plant constituents in Chickweed are Ascorbic-acid, Beta-carotene, Calcium, Coumarins, Genistein, Gamma-linolenic-acid, Flavonoids, Hentriacontanol, Magnesium, Niacin, Oleic-acid, Potassium, Riboflavin, Rutin, Selenium, Triterpenoid saponins, Thiamin, and Zinc. The whole plant is used in alternative medicine as an astringent, carminative, demulcent, diuretic, expectorant, laxative, refrigerant, vulnerary. It is also used to relieve constipation, an infusion of the dried herb is used in coughs and hoarseness, and is beneficial in the treatment of kidney complaints. as an astringent, carminative, demulcent, diuretic, expectorant, laxative, refrigerant, vulnerary. A decoction of the whole plant is taken internally as a post-partum depurative, emmenagogue, galactogogue and circulatory tonic. New research indicates it’s use as an effective antihistamine. The decoction is also used externally to treat rheumatic pains, wounds and ulcers. 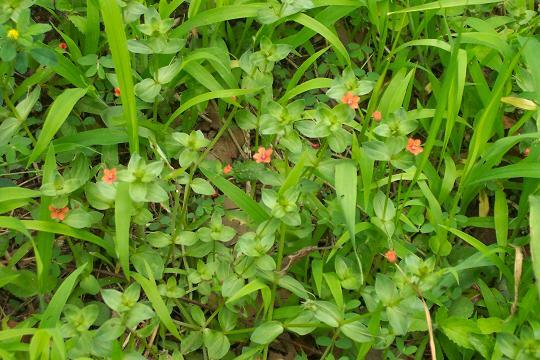 It can be applied as a medicinal poultice and will relieve any kind of roseola and is effective wherever there are fragile superficial veins or itching skin conditions. This little guy is good for just about everything that ails you. Find it in your garden or neighborhood. It is everywhere and finding it is kind of a thrill. It shows you have been paying attention and are learning something. Walking takes on a whole new meaning when you are out there trying to ID plants. I just learned about wood sorrel the other day and now I popping it in my mouth every chance I get. As usual I have overstepped my bounds here and gone way over the limit. But I have half of next weeks wildcrafting blog already done. It will be on wood sorrel, Pine needles and spring tonic if I have room. Please pass the prayer for Japan around, thank you and see you next week. Wildcrafting: #3 Dandelions, Curly Dock, Jewelweed & Making flower essences. WILDCRAFTING: MUGWORT, (bonus plant Wormwood), YARROW AND RED CLOVER. And a little conversation with God and St. Francis on Lawns. Do you know anything about pigweed? I know Amaranth is edible and is known by the name pigweed. 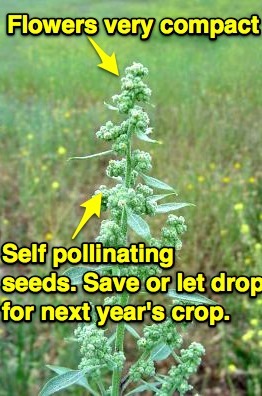 But other weeds are also called pigweed. I had a ton of it growing in my backyard last summer, and a friend told me it was pigweed. She thought it was a nasty, noxious weed and told me to pull it all up! I didn’t do that of course…I thought it might be edible. But I’m not sure if it’s actually pigweed (amaranth) the edible type or not! I haven’t been able to find anything conclusive. I live in San Antonio TX. Any suggestions? Thanks! 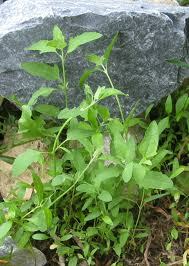 Hi Monica, As far as I know Lamb’s Quarters, Purslane and Amaranth have the common name pigweed. So much confusion evolved around local common names and then Linnaeus’ Species Plantarum of 1753 started the modern botanical nomenclature. Botanical nomenclature is governed by the International Code of Botanical Nomenclature and comes to the rescue at times like this. Yea. Getting a positive ID and the botanical name will certainly help you understand what plant you have and what exciting things you can do with it. Here is a link to Quinoa. It looks like these two are very close and it is all about the flowers. http://www.vurv.cz/altercrop/quinoa.html it’s all in the family. 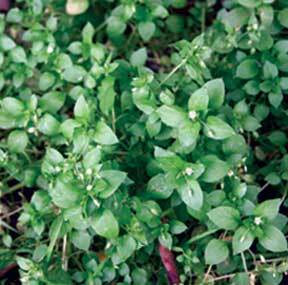 Purslane also known as pigweed is quite different altogether so I think you can eliminate that one. Also there is a lambs quarter look-a-like that has a very strong odor to its leaves. Just rub the leaves and if it has a strong odor its not lambs quarters and let it be. Oh WOW I had NO idea that quinoa greens were edible! I never thought of growing quinoa for its greens – I thought it was inefficient to grow, for its grain. Thanks so much! Thanx for a great post and for promoting the foraging vibe! You are welcome. I am learning so much about all the great stuff I have in my own backyard and having a ball sharing it. I’ve never heard of pigweed-it sure soduns interesting. Wish I could help you out with a recipe to use it…..sorry-I can’t.Oh Laura, those cookies……YUM. I love Chambord. My Mom puts it in the cream filling she makes for chocolate cupcakes. She’s done that for years (she also uses creme de menthe in cupcake filling)…she’s 91-and STILL doing it. SOOOOO good!